As a linguist I can attest to how rewarding it is to be the first to research a topic, and how ridic fun it is for my barely-concealed inner nerd to describe internet speech and slang with formal terminology. Lauren Spradlin, a graduate student at CUNY, managed to do both at once in her analysis of totes constructions, or totesing, that has gained prominence lately in speech and writing. Let’s just say that I’m jelly. Here’s what she discovered. First, how do we totes? This kind of process feels natural to us, yet often — including in this case — it’s a multi-step process. Hidden in Lauren’s descriptive account is something of a step-by-step guide to totesing, and if you’re still wondering what it is, just read the next few lines or skip to the totesed word and you’ll know. Let’s take one of Lauren’s as our example, “ginormous”. First, a wordy explanation, with all the relevant caveats. Then, a really quick one. Locate and identify the primary stress. This is the emphasized syllable, the one said the loudest, from left to right. In this case, it’s “nor”: gi-NOR-mous. a. Speech, not writing, is of concern here. “Comfortable”, at least in the dialect that Lauren is quoting, has no “or” in the middle in speech, and so when performing this step, the stressed syllable becomes “comft”. b. This obeys the sonority hierarchy. In English, the end of a syllable can only get louder, not quieter, which explains why “bulb” feels more natural to us than “bubl”. “Republican”, therefore, remains “re-PUB-li-can”, not “re-PUBL-i-can”. Delete extratemplatic material. Chop off everything past your (reformed) primary stressed syllable: gi-NORM. Ginorm. This is your totesed word. You can stop here if you like. “I just bought a totes ginorm watermelon!”, you can say. Optional affective suffixation. Add a suffix, if you like, picking from: –s/z (ginormz), -y/ie (girnomie), -o (girnormo), or multiple ones ending in –s/z (ginormsies). The spelling is flexible. There are occasional exceptions to this but as their reasoning hasn’t been completely worked out yet, I won’t go into detail. Find the first most emphatic syllable: gi-NOR-mous. Bunch any consonants found directly after that syllable to its end: gi-NORM-ous. Or you can add the endings –s/z (ginormz), -y/ie (girnomie), -o (girnormo), or multiple ones ending in –s/z (ginormsies). Okay! Now you can totes trunc your lexo. But why do people do it? And is there anything to be learned from this? The answer to the first question is easy: it signals group affiliation. Totesing is a relatively easy way to indicate that you’re part of a social group. Hence it’s likely to sound odd when used by somebody who’s not in their teens or twenties (exceptions probably exist), or between people of vastly different social identities. A second reason is likely to be the need or desire to write shorter messages on Twitter and SMS. This could help explain why you don’t need to write ‘totes’ before every totesed word. As for the second question — is there anything to be learned from this? — absolutes. It demonstrates how language users are constantly innovating. Perhaps the most astonishing example from Lauren’s findings is that totesing, because it reform syllables and then clip off the ends, results in many syllable or word endings that aren’t found in any other words in English. Table 9 on page 279 has a full list of either unattested or extremely rarely attested examples, including the endings of “vulg” (vulgar), “celebraish” (celebration), “emosh” (emotional), “desp” (desperate), “nostalj” (nostalgic), “uzh/yoozh/yoosh” (usual) and “cazh/caj” (casual). The last two especially demonstrate the limits of English’s writing system in unambiguously portraying certain sounds. We simply don’t have a typical ending corresponding to /ʒ/ (the “s” in “casual”), so to write this we have to innovate. And even though we don’t find these endings elsewhere, we are still comfortable saying them, demonstrating our awareness of underlying linguistic processes in our speech. As I said above, totesing doesn’t require the word totes. Considering the range of words that Lauren has pulled together into her Appendices, it’s pretty impressive that people are able to introduce entirely new abbreviations, without the word “totes” to signal the process, and be understood. This is helped along by context and the fact that step 2 of our subconscious mental totesing guide often retains the beginning of the next morpheme (word part). “That’s wonders!” wouldn’t be so clear, but “that’s wonderfs!” definitely is. There, who says linguistics isn’t fun? Paul Sutherland writes about endangered languages, sociolinguistics and related phenomena for ALTA Language Services. He is a linguist, photographer and writer with a passion for supporting endangered language communities. To this end, Paul has an MA in Language Documentation & Description from SOAS and has worked with groups including language archives, teaching material developers and UNESCO. 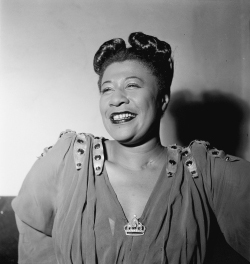 Photograph © William P. Gottlieb: Ella Fitzgerald, November 1946.